A large number of Americans still believe we have been told too little about who did things they shouldn’t have done, and/or didn’t do things they should have done that would have prevented the September 11, 2012 attack on the US consulate in Benghazi, Libya. The result was the brutal torture and murder of Ambassador Christopher Stevens, and the deaths of Information Officer Sean Smith, and two embassy security personnel, former Navy SEALs Glen Doherty and Tyrone Woods. The heat was turned up on this simmering issue last week when emails that should have been turned over when requested by congressional committees months ago were released in response to a Freedom of Information Act (FOIA) request from Judicial Watch. White House spokesman Jay Carney answered a press question on this development by saying that an email that discussed talking points really wasn’t about Benghazi, but about regional demonstrations, despite the fact that the FOIA request specifically asked for Benghazi documents. This email from Ben Rhodes, deputy national security adviser to then-UN Ambassador Susan Rice, who used the talking points on Sunday talk shows, calls attention yet again to the story advanced by the White House and the State Department for far too long after the attack that it was the result of an anti-Islam YouTube video, not terrorism. The administration has no one to blame but itself for the months-long effort to find answers to questions about the Benghazi attack. Had the White House and State Department responded appropriately to legitimate requests for answers to important questions, instead of stonewalling and dodging, we would know what mistakes were made, and by whom. But when you have something to hide, you stonewall and dodge. • February: The US embassy is granted a four-month extension of a Tripoli-based “site security team” of 16 special forces soldiers who provide security, medical and communications support to the embassy. • March: State Department Regional Security Officer Eric Nordstrom asked Washington for additional diplomatic security agents for Benghazi, and said he received no response. He repeated his request in July and again got no response. 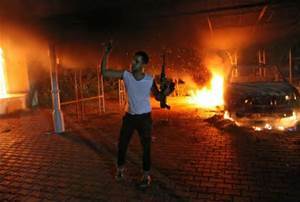 • May 22: An Islamist attack on the Benghazi Red Cross office is followed by a Facebook post warning “now we are preparing a message for the Americans,” and another a month later highlights Ambassador Stevens’ daily jogs in an apparent threat. The Red Cross closed the office. • June 6: Unknown assailants blow a hole in the British consulate’s north gate described as “big enough for 40 men to go through,” and four days later, the British ambassador’s car is ambushed by militants with a rocket-propelled grenade. The consulate is closed soon thereafter. • July: The anti-Islam video “Innocence of Muslims” appears on YouTube. • August. 14: The US security team leaves Libya, despite Ambassador Stevens’ desire that they remain, according to Lt. Col. Andy Wood. • September 10: Al Qaeda leader Ayman al Zawahiri calls on Libyans to avenge the death of his Libyan deputy, Abu Yahya al Libi, killed in a June drone strike in Pakistan. • Why were the requests for additional security not granted, or even acknowledged? • Why was the existing security team recalled when Ambassador Stevens asked that it remain? • After violence against the Red Cross office and the British consulate forced their closure, why was the Benghazi consulate kept open? • Why was Ambassador Stevens in Benghazi, given the rising violence and warnings of violence? • Not knowing how long the attack would last (it lasted 7 hours), why were no US military assets dispatched to at least try to get to Benghazi in time to help? • Why have those responsible for the attack not been hunted down and captured? • Where was the president while the attack was being followed in the White House Situation Room? Some administration supporters say that policies have been designed and put into place to see that a Benghazi-like event doesn’t happen again, so we don’t need another investigation. But doing so must be based upon knowing what went wrong, and if the administration knows what went wrong, why not come clean with the American people, as we expect from “the most transparent administration in history”? The Obama administration is open and transparent, unless an election is coming up, or it will make someone look bad, or it will confound some aspect of its radical agenda. It apparently did not learn about cover-ups from Richard Nixon, whose scandal did not include dead Americans.